The Gonzalez System is a computer ranking model similar to Elo and is a rating exchange system based on research performed by World Rugby. It has been adapted by the NCDA to the demands of College Dodgeball, but can be tuned and customized endlessly to incorporate accurate data. It has been used to help determine seeds for the Nationals bracket since Nationals 2014, and was used exclusively for the Nationals 2017 and Nationals 2018 bracket. A technical upset in the Gonzalez System is when a lower rated team defeats a higher rated team. The overall success rate of the system is currently 80.21% based on 306 technical upsets in 1546 ranked matches played since 2010-09-25. Nationals 2018 had 13 technical upsets over 59 ranked matches, a 74.58% success rate and a tiny dip below the 2018 Season success rate (76.35%). Saturday had 9 technical upsets over 36 matches, about right on par for the 2018 Season’s predictive success rate (~75%) just prior to Nationals. Additionally, there were eight overtimes at Nationals, and four of these were technical upsets, which is fairly average overall. OT tends to split in terms of whether the result was a technical upset or a predicted exchange. OT matches make up 9% of all matches at Nationals, 32 of 355. Overtime occurs slightly more readily at Nationals than across the whole of ranked matches, by a percentage point: 125 of 1546 at 8%. All exchanges for ranked matches played at a Nationals are doubled, so the minimum/maximum range for a rating exchange is 0.020 to 4.000, with a 2.000 exchange being a completely even match. These double strength Nationals matches account for 22.96% of the records, 355 of 1546. The largest upset of Saturday, and the biggest rating swing of Nationals 2018, exchanging a hefty 3.069 in a double strength Nationals match. In fact, at a rating gap of -5.344 between the two teams, the technical upset ranks 4th in eight Nationals worth of historical records. To prove this was a pretty big deal, I’m going to throw even more numbers at you. This upset ranks #32 of an overall 306 technical upsets throughout the Records, in the 89th percentile. It is quite rare for this kind of match to happen at on the stage that is Nationals. 3rd of 13 upsets at Nationals 2018, 8th at a Nationals, 61 of 306 overall. 4th of 13 upsets at Nationals 2018, 12th at a Nationals, 87 of 306 overall. 7th of 13 upsets at Nationals 2018, 38th at a Nationals, 213 of 306 overall. 7th of 32 OT upsets at a Nationals, 40 of 51 OT upsets overall. 8th of 13 upsets at Nationals 2018, 40th at a Nationals, 216 of 306 overall. 10th of 13 upsets at Nationals 2018, 52nd at a Nationals, 252 of 306 overall. 11th of 13 upsets at Nationals 2018, 57th at a Nationals, 266 of 306 overall. 10th of 32 OT upsets at a Nationals, 47 of 51 OT upsets overall. 12th of 13 upsets at Nationals 2018, 59th at a Nationals, 271 of 306 overall. 13th of 13 upsets at Nationals 2018, 60th at a Nationals, 272 of 306 overall. Occurring in the Sedenary Play-In Round of 24, a 21 def 12 seed upset. Of the eight Nationals on record, this technical upset is the largest rating gap (-6.160) of any technical upset that has ever occurred at a Nationals. It ranks #18 of all time, in the 94th percentile. This is obviously the largest seed v seed upset that has occurred in Nationals bracket play, however its exchange is still lower than if UMD managed to defeat OSU in regulation time. The match was close, it was UMD 2-0 OSU at half and OSU climbing back to push into overtime. Had Maryland been able to close out in regulation, they would have toppled the current largest rating exchange at Nationals, Towson def OSU 2-1 in Nationals 2015 bracket play at WKU. That Octonary, round of 16 match was a -5.575 rating gap and largest Upset exchange (3.115) of a Nationals. Being present for both of these matches, the Towson upset was also a doozy to see in person, and OSU was just a few players away from tying it up before time expired. That’s two heartbreaker early exits in a generation for OSU, when they were heavily predicted to win. Occurring in the Quaternary finals, round of eight, a 6 def 3 seed upset. There have been a lot of quaterfinal matches across Nationals history, so seeing upsets in this round isn’t out of the ordinary. What this match does highlight is the competitive field of the third, forth, fifth, and sixth ratings across the entire 2018 Season. I’ve mentioned this many times over the weeks of this season, but that section has been incredibly competitive with sixth jumping to third one week and the reverse happening the next. Even on Saturday, Kent defeated SVSU in the smallest technical upset of the weekend (13th/59). Occurring in the Octonary round, round of sixteen, a 10 def 7 seed upset. This high scoring Overtime match rocked the crowd. It was very, very loud on the court. It fell sixth of the 13 upsets across Nationals 2018. Over all Nationals, it was the 5th technical upset in OT. In eight recorded National Championships across the Gonzalez system, this is the first technical upset at that level. Going into that Championship, CMU had a slight advantage with just 1.007 points between ratings. Further, this is the shallowest Rating Gaps across the eight National Championships. Ranking 221 of 306 technical upsets, falling in the 27th percentile, it placed 9th of the 13 technical upsets across Nationals 2018. Candidly, in one way, this is an example of a failing within the system. The Gonzalez system failed to predict the winner at the highest level. However, the rating gap was very shallow, indicating if an upset were to happen it would be more likely to occur in this circumstance. A deeper potential for an upset to happen, a knock to the usual 80.21% success rate across the whole of the system. The system did deliver the top two ratings to the National Championship in the fairest manner we’ve seen across the NCDA’s 14 year history. It is important to remember that actual results and hard data contribute to the system. GVSU won the match by playing dodgeball better than their competitor. This action can occur at any time. Post Nationals 2018 Ratings, sorted. This is where our Member Teams ended their 2018 Season. Double strength matches at Nationals have the potential to touch every section of the Standings, and they did so with great enthusiasm. Only Kent kept their #5 ranking. Inactive and defunct teams (as determined by the Exec Board, from not playing in the 2018 Season, among other criteria) have been removed from this table. Congratulations to everyone on their seasons. It was a big year. This is where teams will start their 2019 Season. Season to Season Carry Over functions as a way of collapsing the rating gap from top to bottom ratings, and to account for real world losses to a team’s roster. Teams keep 75% of their rating once they enter the off season, and for the remaining portion, it is reverted to the League Mean. We add 25% of the League Mean Rating. More information can be found in the Gonzalez System Spec Doc. Policy [Section 4.2.2.2.1] denotes that any team that did not play a ranked match in the previous season (this case meaning the 2018 season) does not contribute to the League Mean Rating. For various reasons, some teams might be listed in the rating tables (active, paying dues, etc) but do not contribute to the League Mean Rating when Season to Season Carry Over occurs and every team rating is reverted to the League Mean. For example, UNT is a longtime member team of the NCDA, but wasn’t able to play any matches last season. They are listed since they continue to pay membership dues. The rating still reverts, but UNT’s rating does not contribute to the League Mean that affects all other actively playing teams. And just as a reference, all historical ratings continue to revert to the mean from season to season, they just aren’t always explicitly tracked. For manpower purposes we tend to go back and calculate ratings when we need to, like Miami returning after an off period. These calculations do not affect the other active teams, and thus old results, since they wouldn’t be included in the League Mean. GVSU def CMU 6-1 in the 2018 Championship match. Officiating Assignments may be viewed on the G-Sheet. Saturday and Sunday schedules are presented below. Live Saturday Updates on the Records Tab. 2018 Wes Hopkins Fastest Arm Contest, sponsored by District 5 and presented by the DePaul Dodgeball Society, may be a floating event during the first queues of Saturday. We may be gathering results from players before the start of their games, and during halftimes during Queues 1, 2 and 3. Any players that would like to be clocked in should find Zig. Live Sunday Bracket Updates on the Tournament Schedule tab. 2018 All Star Game Draft presented by SAVAGE Apparel Co.
Peep the official first look at the Ladies’ Match design at 51:10. Over the following week and building off Torao Ota’s player logo, we’ll be releasing player logos for each of our All Star Captains as well as the designs for the All Star Jerseys provided by SAVAGE Apparel. See them first on the League’s instagram! In the spirit of March Madness, and with Nationals 2018 approaching soon, myself and other members of the content team have decided to put together some of our bold predictions for Nationals 2018. While Nationals has traditionally been dominated by a select few teams, there is a lot of reason to believe this year could be different with one of the largest and most talented fields in league history. I’ve provided each member’s predictions, as well as my personal brief summary of their predictions. Some predictions are bold, some are not, and others are just downright foolish…or so it seems. Let’s have a look. The annual NCDA All-Star Game takes place at Nationals, which this year will be held at Virginia Commonwealth University. This year, the National Collegiate Dodgeball Association will be changing the format for the annual All-Star Game. For Nationals 2018, there will be 4 All-Star teams competing in a single-elimination tournament, each game will be a one point sudden-death match. How will the four teams be determined? That is another big change for 2018. This year, we will have four player-captains to draft the All-Star Teams. These four captains will be selected in a unique way. 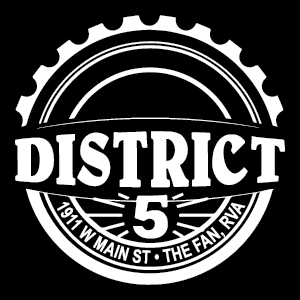 District 5 has partnered with the NCDA to help sponsor Nationals 2018 in Richmond, VA. The local restaurant has been a popular spot in the Richmond area for years and will be an excellent place for teams to gather Friday and Saturday night. They will also be sponsoring a court and be the official sponsors for the annual Fastest Arm Competition. All current and former NCDA members will be welcome to attend anytime throughout the weekend. You can find their website here to learn more details about their restaurant. As we continue to count down the days until the 2017-18 season, I wanted to take the time to provide updates on the progress made towards Nationals 2018. As Director of Nationals for next season I will put forth the best effort in ensuring we have an event that runs well and continues to improve what is the staple event of the NCDA. ROSEMONT – Office of the Director of Officiating (and Records): The Dodgeball Club at Virginia Commonwealth University will play host for Nationals 2018 in Richmond, Virginia on April 20-22, 2018. This was a preferential election. Each Member Team submitted a ballot ranking the candidates by preference. 16 votes dictated a quorum for our current total of 32 teams. The votes were transferred in a instant runoff format until the most preferred candidate won a majority. 30 ballots were received, giving a threshold to win as 16 votes. VCU was the most preferred candidate, winning in the third round of counting by just two votes (16 to JMU’s 14). Akron (9 votes) was defeated in the second round, and PSU/NIU (3, 2 votes) were defeated in the first round. Please view the preferential Election counts output for the full detail on on how the votes were counted and transferred via the preferential voting format. Akron, NIU, VCU, JMU, PSU. * Candidates are presented in a randomized order.